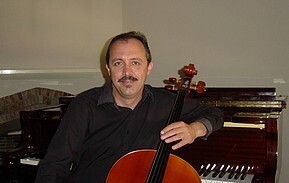 Anatoli Torjinski (Cello) is a member of triple ARIA Award winning group Monsieur Camembert. He is a highly versatile musician - performer, who has a wealth of experience playing in many music genres. Anatoli is also flexible with a line-up. He performs as a soloist, or with duo, string trio, quartet and cover band (electric guitar-vocal). Available for any type of event, Anatoli provides the best variety of music in addition to the best quality.